I’ve never been all too familiar with Jim Henson’s array of puppets. Sure, they’ve always been around, popping up from time to time, whether it be a random appearance on The Simpsons (in the Troy McClure vehicle, Muppets Go Medieval) or the vaguest recollection of watching Muppet Treasure Island as a kid. But they weren’t a staple of my cultural consumption. That was not the case for a lot of the audience that I watched The Muppets with on opening day, as they brought an infectious enthusiasm to the whole picture. So perhaps it is most impressive that in spite of having very little experience with The Muppets, I found the viewing experience to be one of utter delight. 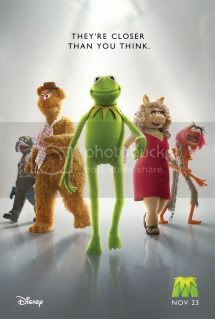 There are varying factors that contribute to the film’s success, least of which happens to be the film’s central Muppet character. Walter (voiced by Peter Linz) is the everyman, erm.. muppet, who lives with his brother Gary (Jason Segal, who also cowrote the film). Walter idolizes Kermit the Frog, and jumps at the opportunity to visit him at Muppet studios in Hollywood. 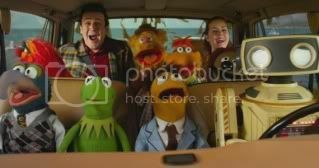 He ends up becoming quite the third wheel to Gary and his girlfriend Mary (Amy Adams), as Walter needs the couple’s help in gathering the Muppet gang back together to throw on one last show. Walter’s a vanilla character when compared to the rest of the Muppet clan, making his exploits seem less than concerning (he really is more of a catalyst for change than a full-fledged character, even in the Muppet sense). 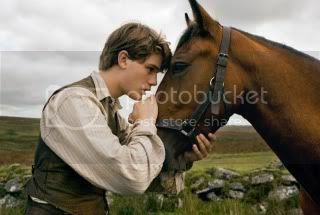 But despite slighting one of the film’s central characters, the film functions on the sheer sincerity on display. Jason Segal and writer/director James Bobbin treat the Muppet characters with genuine affection while addressing the puppet’s waning popularity. The film is very self-aware, to the point that Fozzie Bear acknowledges budgetary constraints when viewing an explosion. Hecklers Statler and Waldorf even go as far as shouting plot point in a critical scene. But it’s never a grating quality of the film. Instead, it’s very innocent and playful, effectively etching a smile onto the audience’s face. If the film manages to succeed in one aspect from beginning to end, it’s that it sets out to create a cheerful tone and carries it along throughout the film without missing a beat. With Bret McKenzie (Flight of the Conchords) contributing various songs (including the hilarious Man or Muppet number) and a slew of celebrity cameos, The Muppets is simply a delight. It’s the sort of picture that was obviously crafted by people who admire Henson’s characters, and simply want to tell a fun and endearing yarn.